While litigation can seem like an impenetrable concept to someone who isn’t an attorney, in many ways filing (or responding to) a lawsuit is fairly straightforward. The Federal Rules of Civil Procedure contain the foundations needed to understand how the process works. Of course, there are also local rules for each federal district court, and hundreds of years’ worth of court cases interpreting the rules, but at its core, a lawsuit isn’t as difficult to understand as it may seem. Wow, that was easy, right? Well, not so fast, because the rule doesn’t explain exactly what a complaint is. The federal courts web site provides a sample complaint form, which you can view here. Check out Civil Form 10 for example paragraphs to include in a civil complaint. Generally a complaint contains a caption, listing the court that it is being filed with; the names of the plaintiff and defendant; the case number; and the judge to whom the case is assigned. The document will usually also include, in its header section, the title “Complaint” so that the reader will immediately know what kind of document it is. The complaint then will list, in numbered paragraphs, several important pieces of information. The sections usually include an introduction naming the parties and a little bit of information about each, a statement of jurisdiction (an explanation of why the court the complaint is being filed with is the proper court to file the lawsuit with), and then a list of alleged violations by the defendant of the plaintiff’s rights, either under a contract or pursuant to a law. View this example complaint for copyright infringement to see how these important sections look. You’ll notice the sections mentioned above, along with a summary of the facts of the case (including copies of photos and other documents), and then numbered causes of action. In this example, the causes of action are for copyright infringement (see page 6 of the example). The plaintiff claims first that it owns the copyright to the photo in contention, that the defendant didn’t get permission to copy the photo, and that plaintiff was damaged by this alleged violation of its copyright. The second cause of action is for vicarious liability, which, in legal terms, means that one person is responsible for the actions of another, generally in the context of an employment relationship where the employer is liable for the actions of an employee. That’s how lawyers sue companies to get larger payouts that if the individual employee alone were to be sued. Finally, the example complaint contains a prayer for relief, which is a legal term for asking the court for some sort of damages. In the example, the plaintiff requests that the court grant it $30,000 for each copyright infringement and statutory damages of $150,000 for each infringement. As you can see, a complaint doesn’t need to be very long. The example is just nine pages in length. But, that’s not all you need to do. When filing a civil complaint with a federal court, you must also include a filing fee, which is currently $350. Once you properly file a complaint and pay the filing fee, the court clerk is required to issue you a summons document (according to Fed. R. Civ. P. 4) which the plaintiff is then required to serve on the defendant. Serving a summons and complaint on a defendant is required in order for the defendant to properly be notified of the lawsuit. 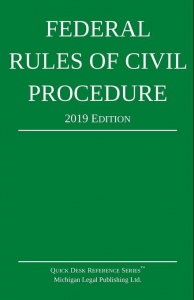 Stay tuned for more articles on how the Federal Rules of Civil Procedure work! WARING: This website is not legal advice. If you need legal help, please contact an attorney.